2010 will mark a number of key decisions for NASA, not least the potential switch from the current Ares I/V architecture to an alternative mix of commerical crew launch – accompanied by a new heavy lift workhorse. A decision is expected to be announced early in the new year by President Obama, although at least three heavy lift vehicles – including a huge 200mt vehicle – were still being classed as options ahead of the Christmas break. Following the Augustine Commission’s review into the future of NASA’s Human Space Flight program, speculation has been rife as to what the President will announce. Such uncertainty has not helped the workforce, most of whom are concerned about still having a job as the shuttle program winds down. That uncertainty is palpable in the Shuttle Program, with some managers – rightly in most cases – avoiding NASA politics with regards to direction on issues such as extending the shuttle program. However, some managers continue to state shuttle extension is no longer possible, citing lead times on “new” external tanks, such timelines that are based solely on a 2015 extension of the program, a scenario that adds flights past the hypothetical STS-137. A 2012 extension remains viable via the part built tanks (ET-139/ET-140), added to the use of ET-122 on STS-135 and Soyuz LON (Launch On Need) support for the final mission, yet the clock is well and truly ticking on that viability. The aforementioned part built tanks are not relevant to the lead times of up to three years, which some managers continue to cite. Such timelines have originated from managers at the Marshall Space Flight Center (MSFC), who are closely tied to Ares, whereas managers at the Michoud Assembly Facility (MAF) cite SMRT documentation that shows no ET machinery has been scrapped, with lead times around half of that stated by MSFC. Protecting shuttle assets – at least for the current manifest that is likely to include the addition of STS-135 – was noted by SSP (Space Shuttle Program) manager John Shannon, during his end of year address to his workforce. “We have all worked extremely hard this last year, and we face a challenging year ahead of us. Thanks to the Team for all of its effort this past year. We overcame a great deal of adversity and performed in an outstanding manner,” noted Mr Shannon on the Shuttle Stand-up/Integration report (L2). “There will be more challenges in the coming year, both from a technical and a human capital standpoint. We have to maintain our focus. There is a great deal of discussion going on concerning what the future will entail, but we must be sure that we do not get distracted from the mission at hand. The work ahead is very clear cut. “(I have) been assured by all of NASA’s Senior Management that the changes being discussed are prefaced by clear statements that any impacts to Shuttle will not be allowed. The SSP will have all the resources needed to complete the mission. There will not be any constraints or unsafe conditions applied, nor any checks and balances lost, through any of the changes being discussed. Only a 2012 extension will be cited in an upcoming bill that is being drawn up by politicians – full details of which are currently embargoed – who are concerned with both the logistical support of the International Space Station (ISS) in the event of an extension of the Station to 2020, and the closing of the “gap”. Also playing a factor is increased uncertainty surrounding the timelines of the Commercial Resupply Services (CRS) contracts, with SpaceX rumored to be struggling with the development of their Falcon 9 launch vehicle, especially with the vehicle’s software. Government reports recently noted the concern that the 100 billion dollar Station may never be fully utilized, adding fuel to the requirement of extending shuttle – given it is the only vehicle that has large-scale upmass, and downmass – capability. An extension of the shuttle program – as stated by the Augustine Commission – would only be viable if the follow-on vehicle is a true Shuttle Derived (SD) LV. 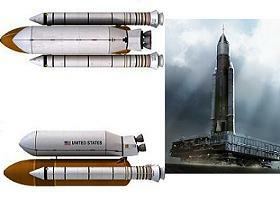 Two examples were presented to the Augustine Commission, one which is based on a side-mount option – called the SD HLLV (Heavy Lift Launch Vehicle) – and another called the Jupiter LV. The SD HLLV – or HLV for short – has received a large amount of attention from the SSP, who have been tasked with the bulk of the evaluations. Those evaluations have resulted in meetings with the Langley Research Center (LaRC) and NASA HQ in Washington, DC – ahead of key “face-to-face” meetings with MSFC. “The team is working action items in preparation for Face-to-Face Meeting at MSFC. The team is ‘GREEN’ on performance ground rules for understanding which missions HLV is best suited to support. Are coming to terms with how to integrate avionics and software between Block I and Block II,” noted one of several notes on the Stand-up reports (L2), with this update dating at the end of November. “Mr. Shannon added that MSFC’s team met with the stakeholders to review progress to date. The group is investigating various designs and technology needs/schedules and comparing this to performance trades, so that when the mission is defined, we will be able to understand how this will affect the vehicle selection. The meetings with the MSFC team related to the study requested by new NASA administrator Charlie Bolden, who created a “Special Team” to evaluate all the Heavy Lift alternatives – which was commented on in early December notes on the Stand-up report. “The MSFC team put together a suite of launch vehicles that the HLV team will assess, made up of Shuttle derived, inline, and Ares V type concepts. 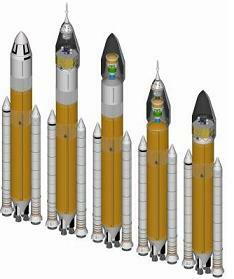 (MSFC) put together a suite of missions that the team will evaluate these launch vehicles for. 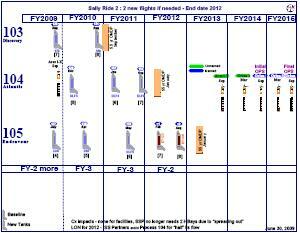 Are still negotiating for some of the ground rules planned for the costing, performance, and so forth. The Program Of Record (POR) is Ares I and Ares V, with both vehicles closely tied at the hip. While Ares I is doubtful to survive past the early part of 2010, Ares V may yet survive – by name at least – as sources note an “Ares V Classic” has been cited numerous times as one of the vehicles being discussed, a vehicle that appears to be akin to a “Jupiter-241 Stretched Heavy” (see image left) – which would be the Block II version of such a “Classic” vehicle. The Block I version would have the appearance and configuration of the “Jupiter-244 RL-10”, although no direct references – no pun intended – have been made by name on documentation, although “different” vehicle options, other than the HLV, have been cited numerous times in December updates. “We will get the outbrief from MSFC’s team that is looking at the different launch vehicle options, some architectural options,” added a Stand-up note in early December. “There will be no decisions out of that. It is really more to scope what different options would cost, what schedules would be required. As far as SSP are concerned, the sidemount HLV continues to be the focus of their evaluations, with the last update of the year referencing work on the departure stage and the payload carrier. However, another Heavy Lift vehicle came out of the blue in December, via an internal 65 page presentation on NASA’s overview (available on L2) of what it believes can be accomplished via the Flexible Path options, per Augustine Commission. While the presentation is far-reaching on various mission outlines – including missions to Near Earth Objects (NEOs), GEO Space Telescopes, and manned missions to Mars (all of which will be reported in an upcoming article) – a monster 200 metric ton human rated “Exploration Class” launch vehicle is referenced several times. 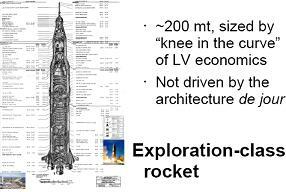 No specific designs are included in the presentation, with a Saturn V schematic shown next to the 200mt references. However, such a vehicle would likely to be a three stage Ares V type heavy lifter. How such a massive vehicle could be afforded is questionable. For the interim, all eyes remain on the President, who – it is hoped – will show his willingness to help NASA achieve its goals via support for an increased budget.